At Hydroblast we are experts when it comes to concrete removal using high pressure water jets. 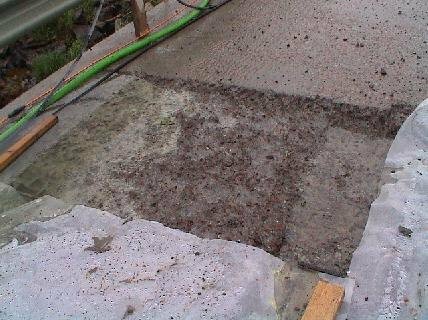 We can offer top of the range equipment and highly experienced operatives to rework your damaged concrete surfaces, get rid of unwanted areas of concrete, and safely expose the underlying support structure or rebar. Concrete Removal by high pressure water jetting is the perfect way to efficiently get rid of the damaged concrete and make way for the new, while simultaneously providing an excellent surface for the new material to be applied. Hydroblast carry out concrete hydro demolition using state of the art Aqua Cutter robots. Our robotic concrete removal equipment allows very precise control of the high pressure jets, which allows us to accurately target the right areas of concrete while leaving the steel structures intact. As we are constantly updating our knowledge, training and equipment, our hydrodemolition robots are better than ever. They provide a superb performance, great efficiency and can work on either curved or flat surfaces with equal effectiveness. Why Use Hydro Demolition for the Removal of Concrete ? 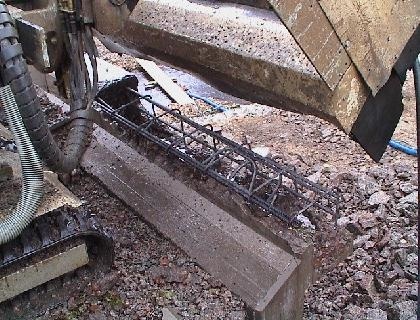 Hydrodemolition is a much better option than mechanical techniques such as chiselling or jackhammering, because unlike those methods it does not cause small cracks in the surrounding concrete or result in damage to the overall structure of the rebar. 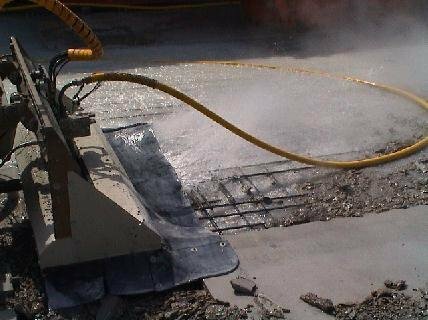 High Pressure Water Jet Concrete Demolition is also much safer, faster and more effective than hand lancing, which is a simpler and more basic form of water jetting which is sometimes incorrectly referred to as hydrodemolition. The hydrodemolition technique evolved from the use of high pressure water jets for making holes, drilling, breaking up or cutting concrete. High pressure water jets have long been used as a way of efficiently destroying or breaking up a wide variety of different materials, especially concrete. The robotic concrete breaking units used by Hydroblast are extremely adaptable and can work horizontally, vertically and overhead as a standard feature. The different attachments allow the operator to perform different hydro demolition tasks such as clearing away concrete under water or beneath bridge decks. Hydro demolition is currently required to be used for the removal of old or damaged concrete under the latest European EN 1504 standards. One of the main benefits of hydrodemolition is its speed and efficiency. The Aqua Cutter removes the old concrete at a much faster rate than the old jackhammers – even up to 25 times faster in many cases, which is an enormous difference. 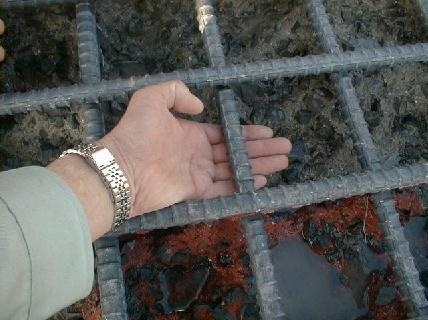 The Aqua Cutter can perform selective demolition, which means the concrete will be accurately removed down to a set depth and no further than this. This leaves a craggy texture behind which offers an excellent surface for new materials to bond. This is in contrast to traditional jackhammers, which typically leave the surface flatter and therefore less suitable for bonding with the new concrete. If you’re in search of a reliable and highly versatile company who can carry out Concrete Cutting, Concrete Removal, underwater cutting and much more, look no further than Hydroblast. Call us on 01677 428 786, email us at [email protected] or fill out our contact form. We look forward to hearing from you.